What Are The Benefits Of Lightweight Footwear? Have you ever heard the expression ‘being light on your feet’? It denotes a certain agility and grace in your gait. Most people I know would certainly be interested in being light on the feet, because heavy shoes dragging your feet down is always an unpleasant experience. Heavy shoes are not only uncomfortable, but they can actually harm your feet, ankles and knees in the long run. Most guys and gals that have taken up walking as a hobby, are always looking for shoes that are comfortable, sturdy and lightweight at the same time. Shoe manufacturers are making great strides (pun intended) in the manufacturing of shoes. There are many brands out on the market that offer some really great options as far as lightweight running shoes are concerned. It is possible that you prefer to wear lower profile and excellent lightweight walking shoes in general. Or you may prefer to wear them during warm weather condition, because the warmer the weather is, the greater breathability you require. A good walking shoe should not only give you good performance, it should also be very lightweight. It should also have great cushioning so that you can easily put in the miles for your trail. The shoes I have reviewed below are really great for both male as well as female walkers, although sometimes you will have to follow the link and search for the same shoes of the opposite gender. It does not matter what kind of gait you have, the shoes in this Top 80 are going to be a great match for you. There is currently a trend going on that leans towards minimalist shoes. These are the kinds of shoes that have great cushioning and structure to protect your feet. Most of the technical walking and hiking shoes out there, have a similar feature set in comparison to their boot counterparts. Ofcourse, with shoes you are always going to have reduced ankle support, because they are simply not as high cut as boots. Shoes also usually have thicker uppers, and are usually designed with greater flexibility in the forefront of the shoe. There are a lot of aspects that you want to bear in mind when you are looking at a pair of shoes. Think about grip, breathability, support, comfort, weather protection, style, design and last but not least… pricing. I have compiled this top 80 best lightweight walking shoes for men and women so that you can more easily find the best pair of shoes for you and your outdoor adventures this summer. If you are looking for low profile shoes in order to tackle all sorts of conditions and terrains throughout all the seasons, then this top 80 lightweight walking shoes will probably have helped you out a bit. For this particular top 80 guide, I have decided to highlight a couple of them for various reasons, which you will find below. Some people look at the cost, others look at performance, yet others look at the design. If you happen to be interested in reading more, please visit my over of best walking shoes. Also, for all you boot lovers out there… I am planning on doing a buying guide about lightweight winter and hunting boots later on. And after that, I am going to do a top list about lightweight military, tactical & hiking boots as well. So there’s plenty of stuff coming. Please check back later! Similar to other slip-on walking shoes from the Skechers brand, these are among the most comfortable lightweight walking shoes on the market. This can be attributed to various factors, including the GOga mat technology, making them one of the most easy-wearing fitness shoes. These are all about comfort. When walking in them, your feet will have a vacation. Not everyday is perfect for running or walking outside, and that is where treadmills come in. Lucky for you, these lightweight walking shoes are also perfect for treadmills. They keep you feeling limber as you up your fitness levels on the treadmill. They are specifically designed for people suffering from achy joints, knee and foot discomfort and other forms of neuropathic pain. That is where the GOga mat comes in. Made from yoga mat material, they are designed to give you the desired cushioning and support, needed to handle impact. If you never knew, impact is the main source of damage to your feet and shoes. If you have never worn Skechers shoes before, you will be amazed at how lightweight they are. They only weigh 1.9 pounds. You will barely feel them on your feet when walking. It also gives your feet an incredible bounce, which is not a common feature in other walking shoes. Apart from the incredible bounce, the mesh design provides air flow, keeping your feet fresh during your morning or evening walks. With these shoes, you can remain comfortable for long periods, whether you are standing or walking. Another quality shoe from New Balance, the MW 577 hook and loop is durable, comfortable and easy to put on. They will provide you with one of the most comfortable journeys, to have ever made by foot. They also reduce fatigue and foot ache, which are very common in old age. Even if your feet are shaped awkwardly or your toes require extra width, this is one of the few shoes on the market that will give you a perfect fit. If you don’t like dealing with shoe strings every day, then you should not miss out on these shoes. These are made of breathable leather, allowing air to pass freely while keeping your feet free of sweat throughout the day. Featuring ABZORB technology at the heels, any form of shock or impact is absorbed instantly, ensuring that your feet and joints remain pain-free. Apart from giving you a great feeling, they also make you look great. These come with two hook and loop straps, fitted with a strong adhesive Velcro tape. The leather used is mainly synthetic, giving them a supple and soft finish, which is easy to clean and maintain. The internal material is soft absorbent fabric, which wicks away sweat and any form of moisture, keeping your feet cool and dry. The synthetic rubber on the outsole gives them a durable and soft surface, while maintaining stability as well. Their easy to wear features, combined with flexibility and comfort, makes them one of the best lightweight walking shoes for elderly. Do you love playing jogging but you always end up with aching feet? If so, get a pair of these Skechers shoes and jog with joy and comfort. These lightweight shoes for jogging are designed for men who are active in running, hiking and other outdoor exercises. You can also wear them if you job involves moving a lot, from one place to the other. With these lightweight walkers, your feet will always be full of energy, ready to tackle the next mile. They come with a good quality supportive sole unit, as well as synthetic and leather upper, to give you a durable and supportive shoe, for your outdoor activities. If you suffer from painful conditions on your feet, and you have to buy expensive insoles to minimize the pain, you don’t have to do that anymore. The cushioning in these shoes is enough to alleviate your suffering. The good news is that you don’t need to invest in a pair of shoes, and then buy expensive insoles. This one does all the work. In fact, it is advisable to buy several pairs of these and store them away somewhere, in case the company decides to cease their production! Rockport has been designing and making fashionable and high quality shoes for more than 40 years. It is one of the most famous shoe companies in the world. They are also one of the first companies to popularize the walking shoe. With such a wealth of experience, you expect nothing less but comfortable and quality walking shoes. If you are looking for casual and comfortable walking shoes for men, the Rockport Eureka is just what you need. These versatile walking shoes are made using full-grain leather on the upper, to give you a tough, supportive and durable shoe. They also come with a mesh lining, which provides breathability. Their rubber sole provides cushioned step while the thick interior padding offers optimum comfort. All areas where the foot might experience abrasion are lined with soft material. They are unique in that they are both comfortable and casual. You don’t have to compromise on one to get the other. With a tongue padding, high-quality collar as well as removable latex footbed, you get nothing but the best when it comes to everyday flexibility and support. The Nike Air Monarch IV is a best-selling shoe in the lightweight walking category. These comfortable shoes can be paired with almost everything. From a pair of shorts, to jeans, they are that versatile. In addition to that, you can wear them continuously without worrying about painful or smelly feet. Even if you get caught in the rain, these dogs will ensure that your feet does not get wet. If you didn’t know, Nike makes millions of dollars every year, from Monarchs alone. That tells you that if so many people are willing to wear them, their quality and comfort must be on another level. Whether you are 20 or 50, these shoes are not designed for any specific age. You don’t have to feel limited or restricted to wear some ugly looking shoes, just because you are over 50. You can wear them to work, to the movies or to the gym. A single pair of these beauties is enough to meet all your needs. They are so stylish that no one will ever notice you have been wearing the same pair of shoes for the whole month. So stop being obsessed with wearing shoes for every occasion. All you need is a pair of Nike Air Monarch IV and you are ready for the occasion. The Monarch is not just a sneaker, it is a lifestyle. 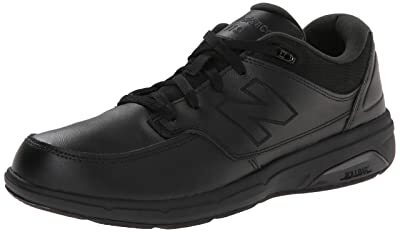 If you are looking for a walking shoe that will solve your lower back pain problems, then the New Balance MW577, is the one for you. These shoes will keep your feet so comfortable that your back pain will soon be forgotten. What makes them suitable as walking shoes is that they come with a wide range of appropriate features, which are required to provide ultimate comfort and cushioning. The inclusion of ABZORB midsole cushioning, combined with exceptional Strike Path outsole, and a padded collar and tongue leaves no doubt as to why they are among the most popular walking shoes, both for men and women. These lightweight walking shoes also come with specific comfort footbed, which is helps to alleviate back pain. With these shoes, you eliminate both back pain and foot pain, thanks to their generous padding. In addition to that, you can have them on your feet as much as you want, making them perfect for walking enthusiasts. Their wide toe box allows your toes to splay naturally. They are made using durable and breathable leather, which keeps your feet dry, comfortable and cool. Their high performance outsole delivers maximum traction on various surfaces. 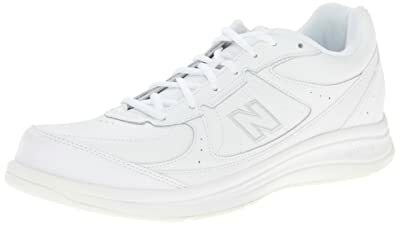 The New Balance MW577 is an excellent choice for male walkers, people suffering from pronation issues, as well as those who spend a great deal of time on their feet. This legendary shoe has always lived to its promises. Since it was introduced in 1968, athletes participating in hurdles, sprints and other activities have used the Puma Roma countless times. It is fully equipped with arch support and padded tongue. They are one of those shoes that you always wanted as a kid but you could barely afford them. Now that you are fortunate to afford them, order a pair and you will never regret that decisions. These lightweight walking shoes for flat feet, tend to run narrow. Therefore, you may need to order a whole size up. Apart from being comfortable, they are so stylish. Everyone will be complimenting you wherever you go. With sawtooth traction outsole, you don’t have to watch your step. They will provide the grip necessary while keeping you stable over different surfaces. When you first wear them, they might appear tight. However, the man-made material on the upper then softens, leaving you with a comfortable pair of shoes that fit perfectly. Keeping them clean is effortless, as long as you have a magic eraser. Whether you are taking a light evening jog or you are going to fetch groceries, these shoes will keep your feet light, comfortable and supported. The Skechers Men’s Equalizer is great for men looking for a casual and comfortable look. These stylish and lightweight walking shoes for wide feet come with mesh fabric uppers, which keep you cool, while providing the necessary comfort. They also feature memory foam cushioned insole as well as shock-absorbing flexible midsole, that is able to accommodate your weight, without transferring impact to your ankles and knees. The memory foam footbed is also removable. Therefore, people with different forms of pronation can use them. All you need is a pair of third party insoles. These can be used for daily walks, gym workouts of even your everyday casual wear. They are also perfect for men looking for walkers with arch support, lightweight, and shock absorbent. With these shoes, you get superior comfort at an affordable price. If you have plantar fasciitis, these are among the few walking shoes in the market, which can help you with the condition. They are also great for those looking for shoes that can replace the traditional dress shoes. These are great shoes for seniors looking for comfortable shoes. Featuring leather uppers and a synthetic sole, they are designed to provide sufficient support wherever you go. The heel is slightly raised, to give you some boost in height while the collar is padded to provide additional comfort. To give you a snug and comfortable fit, these walking shoes for arthritis and diabetes come with a hook and loop strap closure. Its chiseled, manmade outsole is one of the reason why it is recommended for people suffering from arthritis. This makes it effortless to adjust the shoe, depending on the fit that you prefer. Additionally, the contoured footbeds molds, conform to the shape of your feet. The molds also contain an EVA component, which makes you feel as if you are walking on air. The footbeds are removable, leaving you with enough room to insert your custom orthotics. For additional comfort, they have a shock-absorbing outsole, which is also lightweight. One of the best features of these shoes is that they are light. Although they are super light, quality has not been compromised. This is made possible by the zeroG system. With these shoes, you no longer have to compromise your style for design and style. If you engage in any activity that involves walking or standing on your feet for long, then the Skechers Rockland are perfect for you. They are stylish and functional, with various sturdy features that make them durable for such activities. These are predominantly leather made, which increases their strength dramatically. They are not like those shoes that fall apart after wearing them for a single month. Despite the strong leather used on the upper, they have a very soft internal lining material, which gives your feet a new level of comfort. In fact, you will rarely notice you are wearing leather shoes. This reduces the break-in period, while preventing hot spots and abrasions. Inside the shoes, you will find a removable insole. These insoles can be washed to ensure that the shoes remain clean at all times. The insole is cushioned, which adds another degree of comfort to these shoes. It also conforms to the shape of your feet thus reducing fatigue and stress, even when you wear them throughout the day. Another standout feature is the feature is the rubber outsole, with a prominent tread pattern. It absorbs all forms of impact, which is another way of preventing fatigue. The soft rubber provides traction and grip. When it comes to lightweight walking shoes, it is hard to find one that compares to this one. Step out in style and comfort with the Reebok Men’s CL Nylon Classic Sneaker. Straight from the box, you can tell that these shoes were specifically designed for your feet. Although they might appear snug at first, they will eventually soften up, once you get used to them. The quality is more than what you would expect from sneakers in this price range. They also look cool. They are not subdued but not too flashy either. Although the insoles are not removable, they are padded with soft cushioning material. Therefore, you are guaranteed of arch support as you take you evening stroll or walk your dog over the weekend. You will also notice that the shoelaces are long enough and strong. In addition to that, they are a bit elastic. This prevents them from breaking apart, regardless of how much you tighten the shoes. They also leave you with a reassuring grip when you tighten the bow. When you get a pair of these lightweight walking shoes, don’t expect to go back to the shoe shop any time soon. You can wear them everywhere and every day, from exercise sessions to walking. They are true to size and they fit great. Olukai is a popular brand when it comes to making comfortable sandals. The same comfort aspect has been transferred to the Olukai Nohea Mesh, giving you a comfort walking shoe that you can wear throughout the day. If you love flip flops, these are the best alternative to flip flops currently available. The upper is spongy, soft, lightweight and super breathable. The breathable aspect is one of the main reasons why they are so popular as walking shoes. As you swing your foot back and forth, air sweeps through, leaving your feet feeling cool and fresh. The soft and supple upper allows you to wear them without socks. Apart from that, you can collapse their sole and wear them as cogs. They come with anatomically contoured footbeds, which deliver the perfect balance of lasting support and instant comfort. While their upper is remarkably minimalist and light, the sole and midsole are light and flexible while still being substantial. In terms of cushioning, the Olukai Nohea Mesh Shoe does not go overboard. They just provide the right amount of arch and foot support. In terms of size, they tend to run large, which makes them nice walking shoes for wide feet. If you love everything else about these shoes but you have narrow feet, just buy ½ size smaller, and you will gets lots of value for your money. Whether you are an athlete recovering from an injury or an avid walker, the Rockport Rocsports Lite is perfect for your needs. As much as these lightweight walking shoes for plantar fasciitis will not dazzle your eyes, you can rest assured that they will make your body and your feet feel happy. They will give you a cushioned ride mile after mile, as well as exceptional breathability and support. If you have sensitive feet, then you will love walking with these shoes. Their uppers are made of 100% premium leather, which provides adequate protection to your feet. On the other hand, the round toe silhouette ensures that your toes have enough room to wiggle and breathe comfortably. Inside, they are furnished with a man-made lining, which protects your feet against irritation, hotspots and blisters. Therefore, you can wear these men’s lightweight shoes for a long period, and you will not experience any discomfort. Their footbed is lightly padded to give you the cushioning you need while ensuring that the shoes are not too heavy. They also come with dual-density EVA midsoles, which provide shock and absorption. The collar is padded for additional cushioning while the EVA heel cup provides additional comfort and cushioning while reducing irritation. Slipping them on and off is easy and fast, thanks to their open-back design. Whether you are going to fetch groceries from the store or you just want to take a morning stroll around your home, these lightweight walking shoes will provide your feet with the comfort, protection and support they need. The Clarks Cotrell Walk Oxford is a well-built pair of shoes, providing adequate support, structure and comfort in all the right places. This shoe might appear bulky, but that should not fool you. They are incredibly lightweight. If you spend the better part of your day standing or walking, then these shoes are ideal for you. Apart from that, they are highly versatile. You can pair them with your jeans for a casual look or wear them with your suits for a formal look. And at the end of the day, regardless of the amount of time you spent on your feet, you will not experience any pain or discomfort. These lightweight walking shoes for work come with a traditional lacing system, which means that you can adjust them to suit your preferred fit. The entire upper is made of sturdy leather, with double stitching along the seams. Apart from being sturdy, the leather used is also breathable, thus making sure that your feet remain cool and fresh the entire day. The tongue and collar are lightly padded for ankle support. A pull-on tab fitted at the rear will make your work easy when slipping them on and off. On the other hand, the Ortholite footbeds will deliver the cushioning that you need to walk or stand for many hours. Just like other slip-on shoes from Skechers, these are one of the most comfortable shoes currently on the market. This can be attributed to the GOga mat technology, which makes them lightweight but equally comfortable. They are exceptional in terms of quality, comfort and construction. The fabric mesh on the upper allows airflow, which keeps your feet cool during the hot summer weather. Featuring ResalyteTM technology midsole, they have a high degree of shock absorption, keeping your feet pampered during the journey. These are specifically designed to cushion your feet throughout the day thanks to its fabric and comfy synthetic upper. Their rubber soles are engineered with special nodes, which prevent slipping especially when you are walking on smooth floors. The soles also support the footbridge, with the help of the raised center. Their sleek design helps to improve mobility. Apart from that, there are no laces or buckles to deal with. You just slip them on and off easily, which is great during emergencies. You can wear these for long, without suffering from foot strain, stress or fatigue. It comes with a 3-layer web protection, which enables it to withstand various weather conditions. Its 1.5-inch heel gives you the bounce and propels you forward when you are hiking or just walking casually. They are easy to wash using a machine and they dry fast. The Asics GEL-Tech Walker Neo 4 are specifically made for men who do a lot of walking. They are available in two main colors and a wide range of sizes. They come with various functional and attractive features, which are designed to enhance your walking experience. When it comes to fit, you can rest assured knowing that all aspects have been covered. Fitted with a narrowed heel base and a wide toe box, your feet remain securely in position, without any form of pinching or friction. They also feature the Asics biomorphic technology in the upper, to give you an enhanced comfort level. These walkers have everything to offer, from the latest technologies to superior arch support thus ensuring that you can trek for many hours and you will never experience body or foot pain. The medial area of these shoes comes with a bunion window for complete comfort and great fit. Also included is the exclusive Asics GEL cushioning technology, which is world-famous for shock absorption. Therefore, you will not experience any form of discomfort. They also provide exclusive technology that enhances your stride. This makes it easier to walk with minimal energy expenditure. These walking shoes for flat feet are breathable, durable, and comfortable. They come with various features that take care of people with bunions, without adding unnecessary features. Although they might not be as flashy as other brands, they get the job done at an affordable cost. These are lightweight and comfortable walkers, recommended for people suffering from aching feet and knees. They provide support, which helps to ease pressure off the feet. If you walk a lot or stand a lot, then you will appreciate this pair of cushioned walking shoes. They are super light, and airy. The uppers are made of textile for an amazing feel while sandwich mesh offers breathability. Due to their lightweight nature, you might assume that they will not last long. However, that assumption is long. They are sturdy and solidly built, to give provide you with long-term service. Although they are not as stylish as you might have expected, their comfort level is one of the best you can find, when it comes to walking shoes. They are very soft inside. Their soft and cushioned insoles and midsoles provide arch support while minimizing fatigue. They may feel a bit snug straight from the box, but they eventually adjust to the contours of your feet. The New Balance 769 is an all-terrain shoe that gives you a comfortable and smooth walking experience. It features a contemporary design and cool earth tones to give you an exciting and lovely hiking experience. The innersole cushioning is one of the standout features of these remarkable shoes. They are designed to meet your style needs while still giving you a casual look. The multi-shaded brown leather upper gives them a rugged look. It also comes with a lace-up vamp, while the dual-colored laces, give them a sporty look. The uppers are mainly made of synthetic leather while the soles feature synthetic rubber. The mesh fabric provides sufficient lining and cushioning, giving you a comfortable feel. When combined, all these materials ensure a comfortable user experience and a long-lasting experience. The insoles are heavily padded, which keeps your foot in position while minimizing underfoot pressure. In addition to that, the insoles feature ABZORB technology cushioning, which provides addition shock absorption. This advanced level of cushioning allows the shoes to transition easily when you are walking. Apart from the heavy cushioning, they also feature C-Cap midsole as well as web midfoot support, making them perfect for both casual and regular walkers. Similar to other parts of these shoes, the midsoles are made of quality materials, adding to their overall durability. 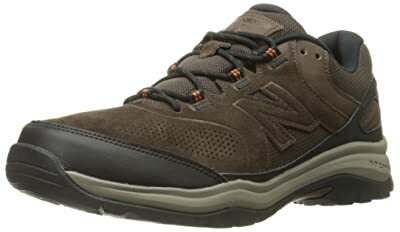 The New Balance Men’s MW769BR is designed to provide you with a relaxing and comfortable support. The anti-slip sole, the perfect grip and the durable materials, make them a long-lasting companion, for every man who loves walking. 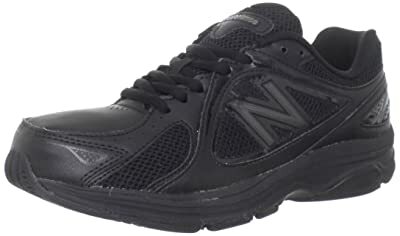 Shiningly black, the New Balance MW813 is one of the best walking shoes for knee osteoarthritis. They are perfect by quality and brilliant by design. They come with an inbuilt rollbar that is great for Patellar Tendinitis. The sole is made of high-grade rubber while the uppers are made of premium leather. Also included in their design is motion control technology, which provides supportive cushioning. Unlike the other version, which is a slip-on, this particular one comes with shoelaces. Therefore, you can adjust them depending on how tight you want them to be. If you are looking for a pair of long distance walking shoes, then the New Balance MW813 are what you need. They will go the extra mile, while keeping you comfortable and retaining their shape and structure. They are also perfect for an office environment. Available in a wide range of sizes and widths, you are assured of finding your matching size. You can combined them with various outfits like polos, khakis and Henley shirt, if you want to keep things professional. It would be safe to say that these shoes are great for the price. They are crisp, versatile and very easy to clean and maintain. Walk with comfort and ease with the Vionic Endurance Walker. Featuring Orthaheel technology, it simply means that they come with contoured arches, specially designed footbeds and deep heel cups. All these features are mainly found in Vionic walker shoes. The Orthaheel technology also helps to reduce over-pronation, thus alleviating common foot pains. This makes them perfect for men with flat feet, who do a lot of walking. It comes with a detachable, biomechanical orthotic insoles, which help to support the feet while realigning the legs. This helps to improve balance and posture. In addition to that, there is a lightweight, soft EVA midsole, which absorbs shock while minimizing stress on the knees, feet and ankles. With such foot arch and heel support, they are one of the best lightweight walking shoes for plantar fasciitis. The removable orthotic insoles are enhanced with antibacterial fabric, which prevents bad foot odors. They are made of rich leather uppers and synthetic mesh panels, which allow ventilation to take place. A lace-up closure gives you an easy entry and a customized fit. Thanks to their non-slip outsole, you can use them for various outdoor activities like running, walking and playing various games. If you are suffering from plantar fasciitis and you must walk, these shoes are your salvation. The Rockport brand produces some of the most comfortable walking shoes for men. This particular one features San Crispino shoe construction technology, which provides great support and stability, with every step. The uppers are man-made and they are easy to clean. These uppers are also breathable, thus keeping your feet cool at all times, regardless of the weather outside. Unlike other walking shoes that might take a week or even a month to break-in, these only require a few hours, and you can happily walk in them without any pain or discomfort. The San Crispino construction also gives them a wide sole base, to support in-stride. The most important part of shoes is the interior and not the exterior. The Rockport Men’s On Road feature CMEVA midsole, which provides lightweight cushioning. The inserts on these walkers are removable, leaving the shoes with enough room inside, to use your custom orthotics. On the other hand, the Fiberlon support shank keeps your feet properly aligned, giving you good balance and posture. This prevents ankles, feet and knee pain. With its reputation for comfort and style, these shoes have your next walk covered. The tongue and collar is padded for extra cushioning and stable foundation. These Rockport shoes are about fashion, comfort and style. They are a nice blend of a casual shoe and a formal shoe. You can wear them with jeans for a Sunday afternoon walk in the park, or with a pair of formal trousers, for your office work and you will not appear out of place either way. One of its main selling points is the comfort factor. These are so comfortable that you can wear them throughout the day. By the time you get home from your work, you will not have any urge to remove them, since your feet will still be happy and comfortable. These are one of the few lightweight walking shoes that are waterproof. If you happen to encounter wet conditions during the course of your walkabout, don’t worry. These will keep your feet dry. Some people might be worried about the price. However, as they say, you get what you pay for. If you want a shoe that will provide support to your shoes without falling apart after a few months, this is the perfect one for you. The Skechers Performance Go Walk 3 Unwind, is one of those walking shoes that a man must have. You won’t have to seek advice from friends and relatives to learn how good these shoes are. All you need to do is slip them on and take a few steps around the house. From that moment on, you won’t need further convincing. Having said that, these sneakers are easy to slip on and off. If your back hurts in the morning, then you need these shoes. You will slip them on easily without even having to bend over. The sole is synthetic while the uppers are made of light but durable canvas material. They come with memory foam midsoles, giving you maximum comfort. You can easily mistake them for slippers, since they are so light. They give you the best of both worlds. They protect your feet like a normal shoe while they are light and easy to slip on, like a pair of slippers or flip flops. In terms of construction, these are solid. Even when subjecting them to frequent use, they maintain their shape perfectly. You can wear them without socks and you will not experience bad odors, since they come with antibacterial treatment. These are also breathable thus allowing fresh air to sweep through your feet. They are true to size. Are you looking for a shoe that brings the ruggedness of a hiking boot and the lightness of sports sneakers? Look no further. The ECCO Track II is a great all-round shoe, which keeps your feet protected whenever you are on the move. Apart from being stylish and good looking, it is versatile and lightweight, making it perfect for various outdoor activities. Although the upper material, which is leather, is extremely lightweight, it also tends to be very durable. The sole is manmade. This ensures that the materials and design used are all genuine and original. Being highly versatile, you can wear them with a wide variety of outfits, based on the occasion and you won’t feel or appear out of place. It features a comfort fiber system, which fights bacteria while making the shoe odor-free. Featuring Gore-Tex waterproof lining, you can wear these specially made boots even during the rainy days. The Gore-Tex membrane allows moisture and perspiration to escape from the shoes while preventing external moisture from penetrating to your feet. The soles are tough and rugged. They not only provide traction and prevent slips, they also enhance the durability of these puppies. They are perfect for light hikes. With an experience spanning more than 75 years, Rockport knows what is good for your feet. When it comes to comfort and style, nothing beats the Rockport Men’s Rock Cove Fashion Sneaker. The name itself suggests the shoe is fashionable and that is the exact truth. However, fashion alone is not enough when buying walking shoes. These lightweight walkers have an extra layer of cushioning, from what you are used to. With a padded collar and tongue, these have all the comfort for all day coziness. Even though they come with numerous durable and comfort technologies built within them, they remain lightweight. Therefore, you can wear them for long periods without suffering from pain. In terms of size, they are not too narrow or too wide. They fit perfectly. Their interior contains a soft lining and moisture wicking material, adding to their overall durability. These don’t require any break-in. You just unpack them from the box, slip them on and enjoy an evening walk. Their construction and quality of materials used is to quality. Be the owner of these shoes and you can forget about aching feet or joints. These orthopedic shoes are made for style and comfort. Featuring dark-brown pull-up leather on the upper, it gives them a high quality finish, which even looks better when you wear them. They come with a lace-up closure, featuring reinforced eyelets, which keeps your foot secure. These eyelets are also rust proof. Another feature that makes them comfortable for walking is the padded collar and tongue. Apart from enhancing their comfort, the padded collar and tongue, also supports your ankles thus preventing twists. A moisture wicking lining prevents accumulation of perspiration inside thus providing your feet with a smooth and healthy environment. Additional comfort features include the EVA contoured footbed, for walking and standing support. This footbed is also removable, to accommodate personal or customized orthotics. These walking shoes for diabetics are finished off with a lightweight, shock-absorbing outsole, for ease of wear and foot protection. The Comfort Curve groove feature on the outsole provides plenty of flex especially during heel to toe motion. In conclusion, these Hush Puppies provide great comfort and perfect fit. They are extremely well-made, lightweight, and most importantly durable. These can be worn as dress shoes and still fit the bill when you want to wear them as casual shoes. If you are looking for waterproof walking shoes and you don’t mind a casual look, these lace-up shoes are a good option. Most classic shoes sometimes seem beyond our reach. However, that is not the case with these casual lace-up sneakers. Featuring a traditional oxford style, these classics feature seam-sealed waterproof leather uppers, which repel moisture, keeping your feet comfortable and dry. Their construction combined with the extended size range, is specifically designed to accommodate the needs of people with hard-to-fit feet. A fiberglass shank is embedded into the midsoles for arch support while creating a smooth gait. When you add superior underfoot comfort, you have a pair of shoes for every occasion. If you are looking for a shoe that will not fall apart after few months of wear, the Dunham Men’s Windsor Waterproof Oxford is what you need. They will last for years on end, without losing their shape, structure or support. The waterproof upper, combined with the rubber outsole will take you through all types of weather, whether it is summer or fall. The Clarks Sherwin Limit features cotton fabric and cow full grain leather upper, lending functionality and superb comfort. They are your go-to shoes when you are taking a walk in the park or just around your neighborhood. With an adjustable lace-up closure, you are guaranteed a secure and customized fit, every time they are on your feet. A synthetic and mesh lining allows air to flow through. Have you ever experienced a sea breeze? That is exactly how you feel on your feet, as air sweeps through the breathable mesh lining on the upper. The removable EVA midsole, which comes with fabric and mesh sockliner offers excellent cushioning comfort. On the other hand, the flexible and sturdy EVA outsole offers traction control while nylon shank provides lateral stability and maximum midfoot support. The soles provide the necessary grip without making squeaking sounds. For reliability and awesome looks, the Clarks Sherwin Limit never disappoints. These are guaranteed to give your denims, cords and khakis enough edge. Talking about the size, these Clarks run wide. However, they are inch-perfect. You don’t have to go an inch up or an inch down. Just order your normal size. They are rugged and classy. The stitching, which is a warm tan instead of black gives their look a nice touch. Whether you are going for social events, walking in rain and snow, or just walking on the beach, these are made for every occasion. These are excellent stylish shoes, which never seem to go out of style. They are lightweight and flexible. They come with a nubuck suede upper, featuring contrast stitching. This current edition has upgraded insoles, using comfortable material. This gives them an anti-odor function, while allowing your foot to breathe with ease. Apart from the footbeds, the uppers are also breathable. The heel is slightly raised to protect against impact, every time your foot strikes the ground. Also included in the design is a rear pull tab, which makes it easy to wear them. You can also use the heel tab to hang the shoes out to dry, when you have cleaned them. These walkers are great for leisure, office, work as well as formal occasions. The brown laces laid over the blue background on the upper, gives them a nice stylish touch. Its rubber outsole is one of the most durable in the shoe industry. Clarks is a renowned brand when it comes to quality footwear. And with the Vargo Walk Oxford, you are getting a pair of lightweight walking shoes that are not only durable but also comfortable. Just like their name suggests, these stylish and comfortable shoes are specifically designed for walking. Their construction quality is top-notch, they look great and they are super comfortable. In short, they provide you with the perfect balance of efficiency and comfort. Featuring 100% leather upper and a durable rubber outsole, these lightweight walking shoes for wide feet come with a lightweight design, which prevents foot fatigue. On the other hand, the double stitching on the seams enhances their durability. They are equipped with Ortholite footbeds, which means that you can walk with them as much as you want, without experiencing painful joints. Their comfort is further enhanced by the use of a lightweight EVA outsole, combined with Cushion Soft technology. Inside, they are furnished with a soft textile lining, which prevents hot spots and irritation. Also, this lining soaks away sweat, thus giving your feet a healthy environment. They feature a traditional lace-up closure, which means you can adjust their fit according to your preferences. And as a bonus, their style is neutral enough, which means that you can use them as casual or formal shoes. Lightweight yet rugged, the Village Walker Oxford is a stylish, durable and comfortable shoe, which can fit numerous occasions. Whether you travel frequently or your job involves a lot of walking and standing, theses are designed to keep up with your active lifestyle. Featuring a rocker profile, these walkers will bend with your stride, instead of running against it. Their improved arch support and traction, keep your feet moving as your day progresses smoothly, without ankle joint fatigue and foot pain. Their construction is great and they are available in a wide range of widths and sizes. If you have wide feet, medium size will fit you perfectly. Lightweight walking shoes should have enough padding and cushioning, to keep your feet comfortable every time you are on the move. That aspect has been sufficiently addressed in these shoes. They come with removable Poliyou air insoles, which provide cushioning. These insoles also absorb moisture and prevent bad odor. For more arch support, you can replace the midsoles with custom orthotics. The interior is also lined throughout, as an additional protection against chafing, friction and hot spots. Additionally, the lightweight polyurethane outsole provides traction and shock absorption. They are Medicare/HCPCS code A5500 approved, as diabetic shoes. Reebok is a famous brand that manufactures some of the best men’s outdoor shoes, and the Reeshift DMX lives up to that reputation. This is a flexible and lightweight athletic shoe for men, made of leather combined with mesh lining on the upper. Just like other shoes from this brand, the Reeshift DMX Ride is breathable and comfortable, keeping your feet happy and healthy everywhere you go. The grip on the bottom of the sole is unbeatable. If your work involves moving around in wet and slippery environments and tennis shoes are allowed, these are perfect for such situations. In terms of durability, these can last you up to 3 years of regular use. They are true to size while the toe box is pretty wide to give your toes space to splay naturally. If you are also suffering from plantar fasciitis, these shoes will take care of your feet. Once you get used to them, pain brought by plantar fasciitis reduces or disappears completely. If you are looking for lightweight walking shoes that combine endless comfort, an outstanding design, quality materials as well as durability, then you can never go wrong with the Reebok Classic leather sneaker. These shoes feature a nice blend of a casual appeal and an athletic feel, resulting in a nice combination that you simply can’t ignore. Their upper is made of soft leather, which delivers the ideal combination of support, comfort as well as a classic look. The upper also features small vents at the forefoot area, which ensure that your feet have adequate ventilation. Due to its sufficient breathability, you can also use it as summertime footwear. These men’s lightweight walking shoes also come with a removable sockliner, which supplies additional comfort. Their outsole is made of high abrasion rubber, which supplies traction while protecting the upper part of the shoe. You will also notice that the rubber outsole slightly extends around the toe. This design protects both the shoes and your toes against abrasions. A Die-cut EVA midsole supplies cushioning and shock absorption while the cushioned collar makes sure that your ankles have adequate support. And as much as these shoes are white, they are easy to clean and maintain. Shoe shopping is never easy. That’s why most people stick with popular brands like New Balance, due to the quality and reliability of their shoes. Talking about quality, the ML501 Classic Sneaker is not your average walking shoe. It is designed with quality materials while the construction is solid, to give you shoes that are hardwearing and durable. With these shoes, you are not going back to the shoe shop anytime soon. Apart from durability, these are very comfortable due to the lightweight cushioning. The padded collar and tongue makes them even more comfortable. When you have them on, your feet feel like they are wrapped in sponge. The double-layer foam midsole provides additional cushioning and acts as a shock absorber, from underfoot impacts. Although they are not waterproof, they breathe very well. They are one of those shoes that makes you feel as if you are wearing sandals or flip flops. These are so great for the warm summer days when you want to go for a walk in the park. They look cool and they can be paired with almost everything on your wardrobe. If there is one feature that all buyers of Skechers Go Walk 3 series agree on, is the undeniable comfort that they provide. Walking with these shoes feels like stepping on a pillow, especially when your feet are wrinkled and cracked with age. This is made possible by the resalyte material and go-pillars technology. These are also recommended for those suffering from aching feet. All the extra cushioning on these lightweight walking shoes will make your pains to reduce and almost disappear. The mesh on the upper is also tight enough. This means that you can wear them along the beach and the sand will not be a nuisance. They are fitted with flexible material, both in and out. However, what makes them so comfortable is the lightweight design. They are easy and light to walk with. They also breathe nicely, ensuring that your feet don’t get sweaty or cramped even during prolonged wearing. Their soles are made of rubber while the two-piece midsole, together with the Goga high-rebound insole gives you an energy boost with every step. Apart from the premier sole present in these shoes, they come with a memory foam cushioning around the heel, which gives you a custom-fit feel. The Skechers Go Walk 3 Reaction combine some of the best technology and design, to give you the perfect walking experience. These Rockport shoes are designed to make your feet great again. Rockport has been working hard behind the scenes, to ensure that people who work hard deserve shoes that work equally hard. These dress shoes don’t even require a break-in period. Just slip them on and head over to your workstation, and your feet will never complain again. What exactly sets them apart from the others in the market? First of all, they come with hydro-shield waterproof construction. This technology repels water from the upper, using a combination of waterproof materials, seam sealing together with a specially formulated waterproof insole. You remain comfortable in wet and dry conditions. Apart from being waterproof, these are slip resistant. With the proprietary diamond-grid non-slip outsole, you can walk confidently on any surface. These are also available in a wide range of sizes, including extended widths. With these shoes, you will never have to worry about rain or slippery floors again. Stay comfortable and classy with these good-looking men’s tennis shoes. They are very consistent, when it comes to comfort and fit. These walking shoes are comfortable straight from the box. They don’t even require a break-in period. After the first few hours, they mold to your feet. They are designed for people with flat feet. This means that they might not have as much arch support as you would prefer. However, this should not prevent you from buying these shoes, since you can replace the insoles with your own orthotics. Looking at the price, they are among the most affordable walking shoes on the market. These shoes are properly constructed using high quality and heavy leather, which makes them long lasting. Outsoles provide a good grip and they produce that satisfying squeal when you cut or stop hard. They tend to run narrow. Therefore, ensure you go at least half a size or even full size, when making your order. They have a fantastic construction and finish. Skechers is a shoe of choice for men who spend a lot of time on their feet, whether walking or working. The Go Walk 3 Fitknit is a lightweight walking shoe, which wraps your feet in absolute comfort. If you are going for a trip and you want shoes that will be kind on your feet, as you tour and explore, these are just perfect. They are great for both indoor and outdoor use. These walking shoes for overweight men will alleviate all your foot and knee issues, within a short period of wearing them. What you need to know when buying these shoes is that they are not designed for rough or hard surfaces. Since they are airy light, don’t expose them to hardwearing conditions, and you will enjoy their service for more than a year. The soft and squishy sole is designed to keep you comfortable on your feet, as you go for light walks. Sizing is not an issue. Just order your normal size. The good news with these shoes is that they belong to lower end price point. You are therefore getting value for your money. These oxford shoes are not just great but they are also one of the most comfortable dress shoes. You can wear them the whole day, without any form of discomfort or pain. These versatile shoes can be worn during formal or casual occasions. They are comfortable and lightweight, thus recommended for people who suffer from aching feet. These are also ready to wear straight from the box. They don’t require any break-in period at all. Soles are synthetic while the uppers are made of premium leather. The uppers are breathable thus keeping your feet cool and fresh the entire day. The sole is also soft which gives you a bouncy stride. Its tongue and collar are padded, which boosts their overall comfort. If you always end up with cramped toes every time you wear shoes for long periods, these walking shoes will help you to overcome that problem. They have a spacious toe box, allowing your toes to splay. They are also spacious enough to accommodate your custom orthotics. You will feel and look great, when you step out wearing these shoes. The Propet Men’s Village Walker Mid is a handsomely crafted pair of shoes, featuring a seamless vamp. It blends the comfort features of known for Propet shoes with the rugged looks of an urban hiker. The upper is made of tumbled leather, which is hand stitched to provide greater flexibility. The leather is also lined with a soft material, to offer extra comfort. These walking shoes for men also come with a padded collar and tongue, to reduce heel slippage and chafing. At the rear, they have a pull-tab, which makes wearing them easy. The pull tab also protects them from damage, occasioned by wrong wearing methods. Additional comfort features include a removable Poliyou airsole, which absorbs odor and moisture, while providing extra foot cushioning. These walking shoes for diabetic feet come with a polyurethane outsole, which ensures sufficient shock absorption as well as traction. On the other hand, the walker profile gives you an easy stride during the day. They are available in different sizes and widths. The Skechers Performance Go Walk are without a doubt one of the best walking shoes for women. They are super comfortable and super light. With these on your feet, you will feel as if you are walking on marshmallows. In fact, it is hard to tell when you move from one surface to the other, since their underfoot support remains consistent on all surfaces. At the same time, they are so comfortable, that they kind of feel like you are wearing slippers, rather than shoes. Their heel is slightly raised, which enhances your walking capabilities. On the other hand, the uppers are made of soft canvas material, which is soft and breathable. With these shoes, you will not suffer from smelly feet, due to their advanced level of breathability combined with the treated ortholite insoles. These are simple to clean. Just toss them inside the washing machine and sit back. Within a few minutes, they will be clean without appearing deformed. Apart from that, they are padded with soft fabric material, which provides protection and cushioning. If you are looking for a shoe that you can wear during your short vacation, this one fits the bill. With these shoes on your feet, there will be nothing to slow you down. These shoes are designed to deliver the ultimate comfort and lightweight performance, for women looking for long distance walking shoes. They are also popular with a number of professional golf players, such as Belén Mozo. Due to the wide range of advanced technologies used in making these Skechers, it is easy to see why. Just like their name suggests, these are specifically designed to enhance your walking. The raft of technologies used is designed to provide you with exceptional levels of cushioning and comfort. First, you will notice that they are extremely lightweight. Key technologies used in these shoes include high rebound cushioning that gives you a springy effect when you walk while providing remarkable feedback when walking on tough terrain. Also included is a Resalyte midsole, which is one of the main reasons why these are among the lightest shoes on the market, despite their ample cushioning. The Resalyte midsole absorbs shock and impacts while the Go Pillars technology on the outsole and midsole also offers shock absorption. They also come with the Goga Mat memory foam fit design for comfort enhancement while the upper mesh provides round-the-clock breathability. Overall, these are great summer walking shoes especially if you are looking for lightweight breathability and comfort. The Skechers Go Walk 2 is your perfect solution to all your aching feet problems. It is one of the best lightweight walking shoes currently available for everyday use. If you have low arches and flat feet, then you understand it can be very frustrating to find perfect fitting shoes. On one hand, wide-fit shoes are too wide, and you will end up layering them with insoles, thus they become too high. On the other hand, normal fit shoes are too tight. The good news is that Skechers shoes provide a generous shoe width. Some people would say that the Go Walk 2 don’t look great or they are not fashionable. The truth is, their design is simple but stylish, which fits most casual occasions. Secondly, fit and comfort is more important when it comes to shoes, as compared to fashion and style. Made of lightweight synthetic and mesh fabric, they are sufficiently padded although they remain super light. Considering that they weigh around 200 grams, you will barely notice you have them on your feet. The mesh fabric gives them breathability and flexibility. Featuring an OrthoLite anti-microbial sockliner, you can wear them without socks. The outer sole is uniquely angled using V-stride walking design, to enhance your walking experience. This is a variation of the Skechers Go Walk 2, with various technical and design adjustments, to enhance your walking experience. In short, they are half shoes, half socks, featuring an elegant design for all age groups. These classy shoes use the advanced V-stride technology, which comes with an angled sole for easy walking. The material used to make them is extremely comfortable and lightweight. It also conforms to your feet like socks, thus the name. They adhere to your feet with sufficient amount of hold. In terms of size, you would say they are a normal medium width. They are perfect for travel, especially during music festivals, where you spend a great deal of time on your feet. You will be the only person with happy feet, as your friends complain about feet pain and blisters. They give your feet a snug fit, meaning that you don’t have to wear socks with them. Apart from their comfort, they also look pretty on your feet. Breathability is another plus. Regardless of how long they stay on your feet, you will never experience smelling feet. Air moves in and out freely, thanks to the light canvas material on the upper. They are also well made and even when they are worn out, you can transform them into house slippers or garden shoes. Walking shoes should be stylish, sturdy and most importantly, comfortable. From the first moment you wear these shoes, you will realize that they were specifically made for your feet. They look great on your feet and they are true to size. You don’t have to layer them with insoles. The toe box is quite roomy, meaning that you will not end up with cramped toes. Apart from the relaxed fit, it comes with a removable memory foam insole, which makes every step bouncy and cushiony. Since they are slip-on shoes, wearing them is easy, fast and effortless, especially if you are rushing somewhere. Whether you are going for an extended shopping trip, or you just want to go for a short walk around the neighborhood, these babies will give your feet the comfort it deserves, no blisters, no hotspots, no feet pain. Your feet will definitely sweat along the way, but the sock lining will take care of that. Don’t worry about arriving home with sweaty or smelly feet. If you are looking for vegan shoes, then you have just found one that matches your lifestyle and personality. From the first moment you wear these shoes, you will realize that you are stepping into a world of comfort. With these shoes, you will no longer blend in with the crowd. You will stand out. They are a class on their own. Apart from that, they can be worn by both men and women. No one will think you are a tomboy. You are just a woman who appreciates style and fashion, but wants to remain comfortable too. These can be worn with different outfits, since they belong to the sneakers category. Your friends will want to know where you got these yeezys. However, deep inside you know they are not the original yeezys, but who cares anyway? They are so close to the real thing and considering the price, you will be hard pressed to get a better deal than this. You will also love how easy it is to walk in them. They are airy light. Unlike other walking shoes, these are not heavily padded. The amount of padding provided is just what you need to cushion your feet against impacts. The RYKA Women’s Dash combines design and comfort, to bring you a state-of-the art shoe, for everyday use. It can be described as the ultimate balance between functionality and style. Whether you are doing a marathon, a charity walk or walking several miles per day, this high-performance shoe is all what you need. It is very comfortable and designed to fulfill your dreams. It is one of those walking shoes that you cannot afford not to have, especially if you are a fitness enthusiast. Just like other shoes from Ryka, the Dash is designed to conform to a woman’s foot. They have a wider toe box and narrower on the heel, which are the common foot dynamics in women. Therefore, these are exclusively made for you. Women love attractive and colorful things and Ryka has ensured that by bringing you these beautiful walkers. Most shoe companies nowadays are obsessed with looks and appearance, while forgetting that shoes should be comfortable. However, these shoes from Ryka strike the perfect balance between looks and comfort. Apart from the attention that you will command when you walk into a shopping mall with these shoes, they also take good care of your feet. They come with a solid rubber outsole, which provides your heels with traction and flexibility. Their arch support is underneath, both at the medial and lateral arch areas. When you bring these amazing features together, you get one of the best lightweight walking shoes for zumba. These are available in both wide and medium widths. Designed to give you a comfortable walking experience, the Skechers D’Lites is probably one of the best lightweight walking shoes for vacation. These shoes are popular with both youths and seniors, thanks to their timeless style. As much as these shoes appear chunky and bulky, you will be surprised to realize how lightweight they are, once you take a few steps with them. One of the main reasons why these shoes are so popular is their outstanding comfort. When you are walking with these shoes, it feels as if you are stepping on pillows. Skechers has managed to achieve this level of comfort by using its exclusive Air-Cooled Memory foam. This foam gives you a soft and incredible cushion while maintaining a long-lasting dry comfort. Its open-back design boosts breathability. Durability remains a key consideration when it comes to buying shoes. After all, if you will be wearing them every day, then they should be adequately equipped to endure the wear and tear that you will put them through. The good news is that these women’s lightweight walking shoes can comfortably handle your daily grind. Even if your work conditions are demanding, these shoes will maintain their shape and structure for a long time, thus making sure that you will get value for your money. If you are looking for a pair of walking shoes that is versatile, comfortable and durable, then the Skechers D’Lites is a solid pick. If you are a busy senior citizen, these shoes are recommended for your daily use. They are one of the best walking shoes for the elderly, due to a combination of various features and technologies. These shoes are also recommended by podiatrists, for people suffering from foot conditions like knee arthritis and plantar fasciitis. It doesn’t matter whether your feet are small or large, these shoes fits all sizes. They are also available in extra wide sizes, making them appropriate for almost all types of feet. Due to their lightweight design, it is easy to move your feet. Apart from that, you will not end up with fatigued feet at the end of your light walk. They are also durable and supportive thus suitable for walking on different surfaces. Other key features include lightweight molded EVA midsole that provides shock absorption, rocker profile to encourage natural walking step and proper walking posture, internal and external heel counters for midfoot support, flex groove for enhanced mobility, padded collar for additional comfort, as well as durable arch support. They also come with removable cushion orthotics. With these wash and wear shoes, the road ahead is almost endless. This is another incredible pair of shoes from Skechers, which offers lightweight flexibility and extreme comfort. It features fabric uppers and synthetic soles, which offer great arch support while preventing foot fatigue, even after walking in them for long periods. The insoles are soft but durable, while the outsole is sturdy but flexible. It also comes with an anti-microbial sock liner, which is very effective in fighting odor-causing bacteria. On the other hand, the impulse sensors fitted on the soles work to eliminate fatigue. It is the perfect blend between comfort and everyday practicality. These shoes make walking a fun and enjoyable task. This lightweight shoe comes with a lace-up closure, which gives you a secure fit, as you go from mile to mile. Other features included in the construction are goga mat energy-return insole as well as moccasin-stitched toe. They come with a wide toe box thus great walking shoes for feet with bunions. All these features are designed to increase overall comfortable usage. Just like most Skechers walking shoes, the On-The-Go Flagship Slip-On Boat Shoe features resalyte midsole cushioning, to ensure that you can relax even when you are on the go. When you consider its features and looks, you get value for money. Forget about tossing of flip flops or flimsy flats in your vacation bag. These amazing shoes are built for the active woman who loves walking and enjoying the great outdoors. Even if you only buy shoes from mainstream brands, it is always good to consider other names that you don’t come across every day, such as Propet. These shoes provide you with all the necessary features. You no longer have to wear ugly shoes, for the sake of comfort. These are both stylish and comfortable. They are for the sophisticated woman, who loves staying comfortable at all times. If you are looking for a shoe that can stay on your feet for long, without urging you to remove them, then the Propet Travelwalker II is a good consideration. Mile after mile, they hug, protect and support your feet. Most importantly, these are highly breathable. Therefore, your feet will remain fresh for much longer. Also, these are incredibly lightweight. As such, you can wear them from home to work, while rolling in style. Once you arrive at the office, you just fold them and put them inside your bag, without any noticeable change in weight. Despite being lightweight, they are one of the most durable walking shoes. Walking just became more comfortable and a whole lot easier, thanks to the Propet Travel Walker II. The Skechers Go Walk 3 Insight features a simple design but functions well if you experience foot pain and fatigue for being on your feet for a long period. It is constructed using fabric, attached on a synthetic sole. You might be tempted to think that due to their flatter design and flatter allure, they are only useful when lounging on the balcony or a quick dash to fetch groceries. However, you will be surprised to know that these can cover up to 10 miles in a day. During this period, they will protect and support your feet, and still maintain their shape and structure. Their wide opening design allows the foot to slide inside easily, without consuming unnecessary time. Despite slipping on easily, they will stay snugly on your feet all day long, due to their flexible and cushioned design. The midsole features Goga pillars and Resalyte, which absorbs impacts and reduces shocks to your arches, thereby decreasing foot pain, after walking for long. The Sketch-Knit fabric used on the uppers is breathable. The insoles are also removable and replaceable, just in case they become worn out and lose their arch support. They are super cute with different outfits such as leggings and shorts. Like its name suggests, the New Balance Women’s WW847 is one of the best lightweight walking shoes for plantar fasciitis, overweight women, and women suffering from supination or overpronation. They are designed for women who love walking but face limitations due to various feet conditions. This corrective shoe helps to maintain proper posture thus allowing you to walk easily and painlessly. All this is achieved without exhausting the feet as well as the rest of the body. Although it comes with various motion control features, it is super light. These motion control shoes are built to limit too much motion. This way, they protect you from overpronation while walking. What is special about these shoes? They are made of synthetic and leather, together with handmade soles. They also contain a graphite bar at the rear of the midsole for stabilizing your foot while preventing any inward movement. Its upper is also breathable thus preventing your feet from overheating. For a secure and a comfortable fit, this shoe features a traditional lace-up closure, together with a foam-padded tongue and collar. The New Balance Women’s WW847 is a great walking and motion control shoe. Although it is on the higher price point, you will definitely get more than you pay for. RYKA Women’s Sky is a comfortable and lightweight shoe, specifically designed for walking. It features a memory foam sockliner, super-lightweight EVA midsole and rubber outsole for durability and traction. These walking shoes ensure that your walking is fun and enjoyable, without the agony of dealing with painful feet and blisters. Some women’s shoes out there are essentially men’s shoes, which have been reduced in size, to accommodate the feet of women. However, these are uniquely customized for a woman’s foot. For a long time, most walking shoes were boring and ugly. Those times have changed. These walking shoes will make your feet look nice. You can wear them with various outfits in your wardrobe and remain fashionable. The soles of these shoes are slightly curved, this enables the foot and the muscles to engage properly thus encouraging you to walk better. In terms of construction, these are made of synthetic leather and mesh, which prevents sweating while improving your overall walking experience. The sole is a combination of rubber and foam thus providing you with some sort of cushioning. They fit as expected. The Skechers Go Walk 4 Satisfy is a pair of extremely comfortable and stylish shoes, designed to meet your daily walking needs. It’s well-made, long-lasting and easy to wear. Also, you can use these shoes for different activities – from running errands over the weekend to light morning walks. Their soft mesh upper, combined with their seamless construction, gives you a comfortable fit. Also, this material allows air to move in and out freely, thus keeping your feet fresh, cool and comfortable. Furthermore, the upper material is flexible. Therefore, as temperatures rise and your feet expand, this flexible material will also stretch, thus giving you a customized fit. It will also make your walking experience as comfortable as possible. Inside these women’s lightweight walking shoes, you will come across the highly responsive and innovative 5Gen midsole cushioning. This full-length foam material softens your foot whenever it strikes the ground to give you a cushioned ride. On top of that, it’s flexible enough to conform to the natural contours of your feet. These shoes are further furnished with Goga high max footbeds, which provide responsive cushioning. Regardless of how long you wear these shoes, you will rarely experience unpleasant foot odors, thanks to the bamboo-lined footbeds. They protect your feet against odor-causing bacteria. For the outsole, Skechers has used a durable rubber material, designed to supply the traction you need while protecting your feet and the other parts of the shoe. For lightweight walking or running errands, the Easy Spirit AP1 is the shoe for you. With a padded collar and tongue, super lightweight leather upper, molded rubber midsole support, removable cushioned insole and durable rubber outsole, these shoes come with everything that you need for a healthy foot environment. They are true to size and available in medium, wide, narrow and extra wide widths. Their construction is solid and the materials used are tough and durable. Since they are manufactured in the US, you can always trust them to give you long-term service. In case you are looking of more arch support, just remove the existing insoles and replace with custom inserts. They feature a wide toe box, giving your toes a natural splay. These white lightweight walkers will keep you comfortable and stable, at an affordable cost. For all your lightweight walking needs, these are you go-to shoes. Easy Spirit equals easy walking. For women suffering from back pain and knee pain, nothing can beat the cushioning provided by these shoes. These fitness walking shoes are constructed with RE-ZORB cushioning technology, which can be found in the midsoles and the outsoles. Equipped with synthetic overlays, high density foam, and breathable air mesh, the Devotion walking shoe delivers exceptional cushioning support in different situations. With fine quality materials and a wide range of features, these are an excellent choice for cross training and casual walking. The breathable air mesh on the upper allows your feet to breathe smoothly, without worrying about bad odor and sweat. The air mesh also eliminates the annoying seams and mesh. Therefore, your feet are relaxed at all times friction free. With these shoes, you don’t have to worry about stress, feet aches and uncomfortable feeling. Featuring a lace-up front, these shoes remain firmly on your feet. Although these shoes are lightweight, their midsole provides maximum support, especially at the arch. They also come with a smooth lining while the anatomical precise-return insole provides maximum cushioning to prevent heel pain. The outsole is made of durable rubber to ensure that they aren’t worn out fast. These darlings are not just for walking, you can use them for various outdoor activities. Enjoy a comfortable walk with these stylish yet lightweight shoes from Adidas. They are extremely comfortable and fit like a glove. Light on your feet, these sneakers combine light foam and air mesh cushioning, giving you a bouncy feel with every step. They are airy light and soft, making you feel as if you are walking on clouds. The grippy rubber outsoles provide traction on different surfaces that you may encounter, as you keep fit. Featuring soft mesh upper, they provide utmost breathability keeping your feet free from bad odors. The soles are flexible, which helps to minimize foot fatigue. With these sneakers, you will not feel as if you are wearing bricks on your feet. These are also recommended for women who are suffering from back problems. They give you balance, while enabling you to walk with natural posture. They are therefore able to alleviate most feet and back problems. They are easy to clean and maintain. When you step out in these shoes, be ready to receive a ton of compliments. This is a sporty, casual shoe, which brings together fashion and comfort. Featuring full-grain leather upper, these shoes keep you moving while improving your ride. It is comfy and cute, designed to deliver guaranteed comfort, support and foot protection, every time you step out with it. They also come with removable ortholite footbeds, which provide all-round cushioning, as you stroll on sidewalks, country lanes, shine or rain. The tough and long-lasting waterproof leather uppers, ensure your feet remain dry, as you splash through paddles. On the other hand, their innovative curved rocker sole, absorbs shocks, conserves energy and cushions your joints, to give you an enhanced walking experience. These also feature EVA midsoles, which absorb shock while cushioning the feet. These midsoles also provide gentle support to your feet. These Clarks are also fitted with nylon shanks, which supply support and stability, even when walking on uneven terrains. You can remove the heel lift and the insoles to get the fit and comfort that you desire. To cap off this amazing shoe, there are rubber outsoles, which provide everyday traction and grip. If you are looking for something waterproof and comfy for a walk, then you have just found your perfect companion. Clarks equals comfort. This women’s slip-on shoe is streamlined, modern and easy to wear. Key features include, ortholite cushioned footbed, soft fabric linings and shock absorbing EVA outsoles. They are extremely lightweight and super comfortable for errands and fitness walks. These shoes fit well without leaving you with hot spots. Their pricing is also competitive, giving you a quality shoe at an affordable cost. Best of all, when you are out and the pavement is wet or slippery, the rubber soles provide a firm grip. The ortholite cushioned footbed is molded in a way that it conforms to your feet, giving you a feeling as if you are walking on clouds. On the heel, you will find a slight elastic pucker, which gives the shoes a tight fit, without slipping. With the CloudSteppers, you will enjoy every step. Apart from being used casually, you can wear with them to the office, since they are stylish and neat. In terms of size, it is advisable to order a slightly bigger one, like half a size up or so, since they tend to be on the smaller side. The KEEN Presidio MJ is a fun and functional women’s walking shoe, which combines reliable performance and a casual appeal. Comfort has been adequately addressed, thanks to the nubuck leather upper together with the mesh lining for breathability. In addition to that, the foam footbed is anatomically designed to conform to your feet, giving you support, every step of the day. You can rest assured that these Mary Janes will soon become your favorite. If you have been looking for cute shoes with arch support without much success, these are just perfect. You can also hike in them, even if the hike means cutting across the city for some shopping. And they look great with skirts and capris. These comfortable shoes give you a lot of room in the toe box, which is just perfect for women with wide feet. Don’t worry about the extra room, they come with an instep strap, which keeps your foot securely positioned, and minimizes slipping as you walk. Additionally, this extra space also allows you to wear them with socks, especially during winter when temperatures drop. Their non-marking rubber outsoles, made from highly durable rubber, make them perfect for different outdoor activities and use. In terms of sizing, they tend to run a little larger. Therefore, when you are buying online, it is advisable to order half a size smaller. These shoes are designed to develop and maintain the perfect stride, while focusing on long-lasting durability and comfort. Many women love these shoes, first because of their looks, ease of wear, style and the comfort factor of course, thanks to the famous Memory Foam Fit. Podiatrists all over the world recommend them for women suffering from various foot conditions. These walking shoes for ladies are true to size, breathability is not a problem, and the fabric is super comfortable. With these on your feet, no rubbing on ankles or blisters on your feet. They do tend to stretch after a few months of wear, which is a good thing because it only makes them more comfortable and easier to put on. You can wear them all day at work, and do all the walking and standing without any issue. They are squishy and light. Moreover, they are not distracting in aesthetic terms, since they are mainly available in muted colors. Most regular shoes tend to be too narrow for women with wide feet. However, the Go Walk Extend is slightly different. They come with plenty of room in the toe area. On the other hand, the sole is very comfortable and provides support. It is extremely difficult to find comfortable walking shoes for bunions these days. With these shoes, your feet problems are finally over. They look good, the quality is great and the reliability is just on another level. These shoes were made for walking. The Reebok Dmx Lite is a popular walking shoe loved for its lightweight and comfortable construction, a stable platform and plush cushioning. It makes you feel as if you are walking on clouds. Apart from that, it’s stylish and versatile for different uses and applications. They are easy to pull on, thanks to their lace-less and stretchy design. Overall, this is a great pair of lightweight walking shoes for plantar fasciitis, high arches, and sensitive feet. Designed for casual use and everyday walks, the Dmx Lite features a low-cut design, which gives your ankles freedom of motion. It comes with a textile upper, which gives you a snug fit and a breathable feel. Also, the upper material is flexible, and will not exert any pressure on your feet at all. 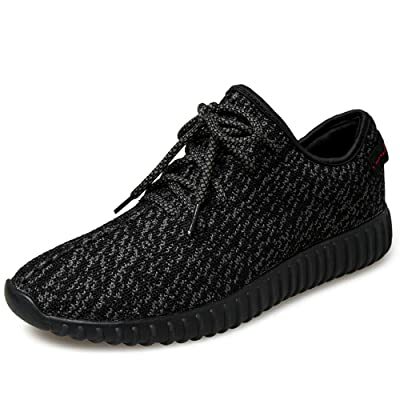 Therefore, if you are looking for lightweight walking shoes for neuropathy or similar conditions, then you will enjoy the comfort that these shoes provide. A midfoot neoprene strap locks down your foot in position while their sturdy rubber outsole supplies adequate traction as you walk. From the time you wear them in the morning to the time you remove them at night, these shoes will remain comfortable throughout. In fact, it’s highly likely that they will become your favorite pair of outdoor shoes. Propet Stability shoes are designed for women who love their feet. They are supportive and comfortable walking shoes, featuring the advanced Rocker profile for more stability and better movement and a smooth stride. These walking shoes for foot pain are available in different sizes, running narrow to wide. You are therefore guaranteed to find a perfect size for your feet. Other support features in these walkers include external and internal heel counters, which support the Achilles tendon and the ankles. The footbeds are padded and removable. Therefore, if you have high arches and you require more arch support, you can replace them with custom orthotic inserts. They also feature a wider heel, built in heel stabilizer, as well as a sole base. All these features provide an extra measure of stability thus preventing your feet from rolling when walk. Also included is a protective arch bridge, which provides all day support. When it comes to construction, the uppers are made of full grain leather while the brushed nylon lining increases breathability. Additionally, the padded tongue and collar, together with the D-ring speed lacing system makes sure that your foot is always secured in comfort. They come with a lightweight rubber sole, featuring a multi-directional tread for enhanced traction on various surfaces. These rubber soles also enhance their durability. Are you tired of walking in uncomfortable shoes every day? You put your feet through a lot, and they deserve better. A proper shoe is all you need, and that shoe is none other than the Easy Spirit Women’s Romy. With a design perfect for leisure activities and light walking, it is easy to see why the Easy Spirit Women’s Romy is a preferred walking shoe for women. Whether you are just mowing the lawn, or you just taking a fitness walk down the trails, your feet deserve a comfortable home, free of all the constant aching and discomfort. These shoes enable you to pursue all your activities to the best of your desire. Durable and light on your feet, they are constructed using breathable leather uppers, which mold to your feet for additional comfort. Additionally, the classic lace-up design, gives you a personalized feet while ensuring that your feet will rejoice the minute you slip these shoes on. With the removable and padded sockliner, together with additions like shock absorption and excellent cushioning, you will not feel like taking them off even when you arrive home. Best of all, these are not only comfortable, but high quality too. They are available in different sizes. Just choose the size that fits and let your feet live in luxury. These are also affordable thus a reliable alternative to the high-end walking shoes with the same features. If you are looking for a comfortable walking shoe, with the features and benefits of walking sandals, then the Clarks Sarasota is exactly what you need. Constructed using full-grain leather upper, the Clarks Sarasota is comfortable for casual weekends and nice enough for work. As you see, it gives you the best of both worlds. One great thing about these sandals is that the straps running across the forefoot is adjustable. Whether you have chubby feet or narrow feet, you can always adjust the strap according to the fit that you desire. They break in within a few hours of wearing them. You don’t even require band aids to do that. Construction is durable and high quality while the suede insole is one of the most comfortable. Both the insoles and the uppers are highly resistant to stains. The flat to low heel offers great support while molded insole keeps your feet stable. The insoles also offer good grip, without your feet slipping around. You can never go wrong with Clarks Sarasota Sandal. These sandals for plantar fasciitis are soft like marshmallows but they also provide good and firm ankle support. They run true to size. If you are looking for lightweight walking shoes that you can use for errand-running and casual daily walks, then the RYKA Dominion is a perfect choice. It features a low-cut profile, which promotes unrestricted ankle mobility. On the other hand, the rounded-toe design gives your toes enough room for wiggle. The upper features jacquard knit construction, which gives the shoes an attractive exterior while boosting breathability. The sides are then strengthened with synthetic overlays, which lock down your foot, thus preventing unnecessary side-to-side movements. A traditional lace-up closure gives you a customized fit while the cushioned tongue protects your instep against pressure exerted by the laces. The collar and the tongue are covered with smooth lycra, and they combine together to give you a snug but comfortable fit. The midsole unit is primarily made of EVA foam, which is soft, lightweight and flexible. Also, this material is resistant to UV damage and water. It conforms to the shape and contours of your feet to give you a customized fit. These men’s lightweight walking shoes are further equipped with RE-ABZORB technology, which supplies additional cushioning. This foam compound is also specifically engineered to provide shock absorption and responsiveness. For the outsole, RYKA has used an abrasion-resistant rubber compound. Apart from being slip-resistant, this rubber compound is extremely durable. These walking shoes for women are designed to offer consistent style with easy maintenance. The soft and washable leather upper, comes with a French seamed vamp, for enhanced breathability. They offer exceptional support and comfort, for any woman suffering from any painful foot condition like diabetic foot problems, arch pain, and arthritis. They can also accommodate bunion feet. Their feel and fit is terrific and you can combine them with a wide range of outfits, including straight leg pants and capris. If you are planning a trip that involves a lot of walking, such as sightseeing, these are the shoes to wear. With a padded collar and tongue, they keep your feet feeling comfortable. They also come with various support features including an internal heel counter as well as an inbuilt heel stabilizer, which improves ankle support. The removable orthotic insoles provide lots of ample padding. Together with the molded EVA midsoles, you are assured of superior shock absorption. These orthopedic walking shoes for women offer superior traction through the razor cut rubber outsole. When it comes to size, they tend to be on the lower size. When ordering online, go half a size up for normal feet and a whole size up for large or wide feet. Easy Spirit is all about comfortable shoes. These comfortable shoes are designed to take push you through the day, from morning to evening, without any form of discomfort. They are available in wide and regular widths, as well as various sizes, for the most demanding feet. These are synonymous with functionality and style. Everything the high-end sneakers can do, the Easy Spirit Ellicott can do better, but without the high price point. Whether you are looking for dress shoes, ballerina shoes or simply casual shoes for a laid back weekend, these are the shoes to go for. Their outstanding versatility is rare. They come with an EVA midsole, combined with cushioned footbed to provide hours of comfortable and flexible wear, as well as dependable traction. The lightweight outsole and the breathable mesh footbed provide extreme comfort. An additional feature is the zippered closure, making them easy to remove, especially when passing through airport security. To sum it up, they are comfortable, super light, easy to put on and off and most importantly, they are offered at competitive prices. Grab a pair and say goodbye to aching feet. When the heat of the city becomes too much to handle, just grab a pair of these Air Mesh hiking shoes and enjoy cooler climates. It is one of the lightest and most comfortable walking shoes for women. They provide an easy transition from trail to town due to their playful color options, together with their casual style. It would be fair to say they are one of the best lightweight walking shoes for women. With remarkable water resistance, they remain incredible protective and comfortable whether you are walking through lakeshore or shallow water streams. Their arch support is great and yet strong enough to give you balance. They are well ventilated, in such a way that even when the summer temperatures are soaring, your feet remain cool and fresh. When it comes to support, they are flexible in the toe and forefoot area, yet supportive underfoot. Every time you are wearing them, it feels like someone is massaging your feet. They have stretchy uppers that adjust to the movement of your feet, and a firm sole, which provides additional foot protection even when walking on rocky terrain. Despite their name, you would not call them hiking shoes per se. They are somewhere between a trail runner a walking shoe. Lighter than a hiking boot while the sole is sturdier than a walking shoe. The toe comes with a protective rubber toecap. There is a plate beneath the underfoot to protect your feet against potential bruises from broken pieces of rock. In conclusion, the Sugarpine Air Mesh is supportive, comfortable and provides decent traction as well as water resistance. They are perfect for hiking around town while their playful color options give them a feminine design. Comfortable is an understatement when describing the Go Walk 3 Renew walking shoes from Skechers. These technical shoes utilize the proprietary Resalyte cushioning, together with the shock absorbing Goga mat footbed technology and high rebound Goga pillars, giving you walking shoes with ultimate comfort. They are perfect for walking, exercising and travel. It is always hard to improve on the Go Walk style, when you consider the numerous superior qualities in this line of shoes. However, the company managed that in the Go Walk 3 Renew, to give you shoes with an internal footbed and a more padded heel. They are so airy and light. If you’re a Go Walk fan, don’t miss out on these awesome shoes. They are worth every penny. Since they are slip-on shoes, you can wear them like slippers around the house, once they get worn out. This way, you will have utilized them to the last coin. Fit is as expect. However, if you have wider feet, just order half a size up, just to be sure. The Asics Women’s Metrolyte Walking Shoe is the perfect blend between good foot health, stable posture support and proper walking balance. It is also a stylish and charming shoe, which brings all the joy and happiness to your world. This lightweight and stylish shoe comes with a wide range of exceptional features, making it a quality, walking shoe. They are airy and extremely lightweight, yet sturdy and supportive. Some of its main features include a breathable mesh upper, which provides flexibility as well as accurate air control inside the shoe. This allows your foot to move naturally and still breathe. The ortholite sockliner provides your feet with cushioning while managing moisture control and providing solid arch support. Additionally, their mono-sock construction allows for a snug, smooth and comfortable fit as the shoe embraces your foot. They also feature a lightly padded collar and tongue, which offers sound support and comfort. Their midsole is much lighter, more flexible and softer than conventional midsoles. This type of midsole is preferred by walkers and light runners, especially for women looking for more fluid movement. Featuring a wet grip outsole, they are designed to great traction and overall ankle and foot support on various terrains and surfaces. The combination of the Metrolyte’s style, with great technology and affordability makes it one of the best lightweight walking shoes for travel. Are you looking for a super comfortable walking shoe? If so, then you need to check out the GO Walk 3 Super Sock 3. It is a half sock, half shoe, and all-round comfortable. It is designed with the innovative Skechers performance materials and technologies, specifically for walking. With these shoes, you get unmatched shock absorption, together with a super responsive ride. The Quick Fit portal at the rear allows an easy on and off. These are designed to be worn without socks, thanks to the ortholite anti-microbial sockliner, which prevents slippage while inhibiting odor. It is hard to find another shoe on the market that takes away all forms of foot pain as this one. Therefore, if you are dealing with plantar fasciitis, knee arthritis, bunions and recovering from foot surgery, these are the perfect shoes to wear when walking to school, work or just leisure walks In terms of sizing, these shoes fit normal to wide feet. However, if your feet are too narrow then you might find them a bit wide. The Propet Bilite Walker is designed for the active woman who wants a practical and supportive shoe. Most shoes designed to alleviate foot problems tend to comfortable but ugly. That is where this shoe comes in. It strikes a balance between looks and comfort. They come with Velcro straps which allow you to adjust the fit of the shoe. These also have a very soft heel area, which practically means they don’t require a break-in period. The heel area is padded, but they are also deep enough to allow custom orthotics. Once you buy these shoes, you will be wearing them every day, without a doubt. They might get dirty along the way. However, dirt should not be something to worry about, since these are machine washable. Just toss them inside that thing and give them a few minutes. Their soft uppers and ballerina-inspired toe, gives them a feminine appeal. Your feet might sweat, but that is taken care of by the Nylex fabric lining, which wicks away moisture instantly, maintaining a healthy foot environment. There is also the removable Prolite footbed, which is perforated to maintain an odor-free, cool environment while keeping your feet fresh. The internal heel counter provides extra support to give you a sturdy stride. They are so cozy that a 90-year-old diabetic can wear them! The Devotion Plus is an updated to the best-selling RYKA devotion. It comes with all the comfort and performance features of the previous version. The Devotion Plus enhances the good qualities of the former while revising the negative features. This lightweight walker is designed for fitness walking and hybrid training. Although it is sold as a running shoe, it comes with various features and attributes such as cushioning, comfort and breathability, making it excellent for walking too. It is known as a hybrid trainer and fitness walker, since it is able to offer a wide range of benefits in different situations. This walking shoe is also engineered to help women with balance issues. It also provides great support for plantar fasciitis and arthritis. This success can be attributed to the use of a removable footbed and compression foam midsole. The shoes are properly constructed and their arch support is one of the best. The toe box is wide, which prevents your toes from rubbing against the sides of the shoes. They also seem to run half a size smaller. So, ensure you make the sizing adjustments when placing your order. Who ever imagined Skechers could improve on the Go walk 3? Similar to other shoes in the Go Walk series, the Go Walk 4 comes with Goga Max technology insole, which delivers high-rebound cushioning, sock-like Go Knit uppers for comfort, breathability and fit, lightweight responsive cushioning and underfoot adaptive Go Pillars for extra cushioning. So, how different is the Go Walk 4? These are designed to provide greater stability. They are also engineered to last longer than the previous versions, thanks to superior construction technology and enhanced materials. They provide much more cushioning than the Go Walk 3, without much addition in weight. These fit much like your regular shoe, with a narrower heel. If you have narrow feet, then you will love these shoes. On the other hand, if you have wider feet, then you should consider buying a slightly larger one. Half a size up would be okay. The mesh upper is engineered in a way that it can expand naturally with your feet. The footbeds are lined with bamboo for antibacterial odor control. With highly breathable uppers and a comfortable upper design, the Go Walk 4 will give you the most advanced walking experience. The Propet Travelwalker is a trendy and purposeful walking shoe, delivering hours of comfort wherever you go. They are also stylish, both in terms of design and colors that you can choose from. These walkers are breathable and flexible. They are also lightweight, although this does not affect their construction and durability. For women with fallen arches, the arch support in these shoes is enough. The soft internal fabric lining provides all-round comfort, and pampers your feet the way they deserve. However, if you arches are high, you might have to wear them with custom orthotics. The good thing is that they are deep enough to accommodate third party insoles. They come with two Velcro straps, which can be adjusted, giving you a custom fit. The resistant toe cap offers protection to the toes against all forms of abrasion while the lightweight EVA midsole offers support and stability with every step. The shoes are then finished off with a durable rubber outsole, for reliable traction. You don’t have to compromise style and comfort, thanks to Vionic Action Tourney. They are made of leather and fabric together with a lace entry. With these shoes, you can be sure that fitting will never be an issue. It also comes with a heel pull-on loop, for easy on and off. In addition to that, the textile upper ensures that you get optimal comfort while the rubber outsole offers underfoot protection while providing durability. They are engineered with removable microfiber EVA orthotic insoles, to provide cushioning and comfort, wherever you wander. They are designed to provide support and cushioning, giving you the freedom to live an active life. Their quality is profound and you can expect them to serve you for long. The textile uppers are also breathable, ensuring that your feet don’t smell even when you wear these shoes all day long. With the help of these shoes, you can always be sure that foot pain will never prevent you from living an active life. Just what the doctor recommended! Travel light with the Propet Travellite MJ walking shoes. These lightweight and comfortable shoes are sure to add style and comfort to your stride. Resting atop a lightweight EVA outsole, the MJ features nylon upper and mesh lining, which wicks moisture away for fresh feet. They also come with an adjustable elastic cross strap that allows a comfortable and secure fit. On the other hand, the padded insoles offer great underfoot support. These features are included in these shoes to give you a memorable walking experience. If you have high arches and wide feet, these shoes will meet your walking needs perfectly. They are cute and stylish. You can wear them with trousers, skirts or tights. Whatever you choose to wear with them, you will always remain fashionable. These easy to wash and maintain shoes can be worn with or without socks. Whichever way you prefer, comfort is never compromised. These shoes have a very casual design, that is bound to be to anyone’s liking. They look totally classic and have a very decent construction. These will surely be very comfortable during a long trek in a warm month. These Intercepts have high quality leather uppers, like most Merrell shoes do. They are very water resistant, but have tongue and mesh sections to guarantee good breathability. If there is anything you need, it is good internal moisture regulation. You don’t want to be drowning in your own shoes, after all. They also have an Aegis treated lining that will prevent microbe odour from building up. These shoes are known for their super reliable performance. They have a rubber outsole, made of Vibram. The soles have 4. 5 mm lugs, so most people will have plenty of grip and traction on very rough terrains. On the inside of these shoes, your feet will meet an anatomically shaped Ortholite footbed, so you are guaranteed a snug fit. The moulded footframe will keep you supported at all times. Keen has always been a favorite of mine. And these are some of the greatest best sellers there are. They are very sturdy and you’d think they would be pretty heavy on the foot. But the moment you put them on, you realize that, yes, this is indeed a very lightweight walking shoe. The metatomically shaped footbed will conform to your feet, no matter what shape they are. They have a very breathable exterior, so they are suitable for trails and treks throughout all kinds of different terrains. With KEEN, you can be sure that you are going to have the exact right combination of leather uppers and mesh for optimimal breathability. The DRY membrane will prevents water getting in your shoes, whether it be from rain or snowfall. Damp air is nicely wicked away, ensuring that the internal climate of your shoe remains cool, dry and comfortable. These Targhees will help you lessen the strain on your feet, preventing potential damage from shocks, thanks to their great suspension and stability. Their shock absorption will dissipate the effects of impacts, thereby relieving your entire foot with every step. Jack Wolfskin is an underrated brand, that not everybody knows about. But sometimes, the underdog can be a really good dog. And that is exactly the case with these lightweight walking shoes with arch support for flat feet. They have a very unique styling. The paw print logo is a truly awesome design choice, if you ask me. They are ready made for whichever trail just so happens to be your favorite. If you are hiking with a light pack and you want to also have a light walk, then this is probably the best brand that you can go with. They have water resistant polyester and suede on the exterior. It is a waterproof Texapore membrane. And there you go thinking GoreTex was the only player in town. Texapore does a really great job at wicking away all the moisture build up inside your shoe. They dry up really fast. They may not be ideal for heavy rainfall and snowfall. But generally speaking, they will keep you dry in moist environments. They are fitted with Traction outsoles, which keeps them light and flexible all throughout your walk. They will get great grip and because of their great cushioning, they will also protect against impacts, stones and other stuff that a rough terrain might throw at you. Feel free to stub your toe against everything that comes in your way. The toe box areas have very strong caps to ensure that you won’t feel a thing. The heel area also has a cap, to protect you from abrasion. These are a pair of lightweight lace up sneakers, which have that classical and well recognizable Oxford design. They go really well with pretty much all outfits. These shoes have incorporated Adidas’ ADIPRENE technology (and EVA midsole), which helps absorb shocks in the heel and revert that bounce energy right back to your forefoot. Next to being springy, these shoes also have great traction. Thanks to the leather footbed, it is very comfortable and the fit feels almost personalized. If there was every a stylish walking shoe with arch support, then this one has to be it. Commenters have said that putting on these shoes is almost like putting on a glove. They are very comfortable to wear. They aren’t the cheapest shoes on this Top 20, but they are well worth their price, if you can afford it. All serious walkers that I personally know in real life, are familiar with Merrell. The Merrell company has made great improvements in the past years when it comes to combining both comfort as well as design. These guys have always specialized in making outdoor activity shoes, which are appealing to both men and women alike. This is a really great comfort shoe with arch support. These are some seriously light hiking shoes, which are also comfortable as well as highly durable. You can take these with you on every trail that you intend to go trekking on, because they were made to last. They are priced fairly low, and that makes them extra attractive. This company makes claims of making the finest walking shoes known to man. Not exactly the most modest opinion, but after having tried their shoes… I must confess they are not lying. Their range of lightweight footwear is fairly impressive, and other brands should watch out for Mephisto. A lot of their shoes are hand made. So depending on which model of theirs you are going for, footwear from this company can set you back a few hunge. But the fact of the matter is that shoes from this brand are some of the best orthopedic shoes for men/women for the money. This model denotes class, elegance and even a tad big of sophistication if you don’t mind me saying so. They are totally worth your money, especially because they are just so darn comfortable. You can wear these casually or formally, since they are so stylish and well finished. I’ve worn my Mephistos both on regular walks as well as to business meetings! Sleek and comfortable, the Avia Avi Venture is the perfect outdoor shoe for people who spend a considerable amount of time on their feet. Crafted using a combination of leather and textile, these shoes will provide a sturdy barrier against the elements while ensuring that your feet have adequate ventilation. The leather used is sturdy and long-lasting, which means that these shoes will serve you for many years. And as much as they are sturdy, you will notice that they are surprisingly lightweight. Therefore, these will not weigh you down or cause fatigue when you are walking or standing. With these shoes, you can walk for longer distances and shed more pounds. These lightweight walking shoes with arch support, come with a hardwearing, solid rubber outsole, which supplies superior traction. As long as you have these shoes on your feet, you can walk on pavement, grass, gravel, and dirt, and you will not experience any slippage. Also, this rubber can withstand wear and tear. The outsole also features flex grooves, which enhance the flexibility of the rubber used, thus promoting natural foot movements. The tongue is padded and soft for additional comfort while cushioning your instep against pressure exerted by the laces. Their shaft measures 2.5” from the arch, to provide your feet with the necessary cover without limiting your range of motion, regardless of how long or far you intend to walk. Approved by the American Podiatric Medical Association, these lightweight walking shoes for plantar fasciitis come with a midsole made of molded EVA foam. With this type of cushioning, you are assured of responsive movement as well as shock absorption. The midsole unit is further enhanced with the company’s Archrocker structure, which reinforces the midfoot area. This component also allows your feet to roll smoothly while promoting natural walking gait. Their interior is lined with a removable sockliner, which conforms to the shape of your foot for optimal comfort and coverage. These shoes have a very lightweight construction. They are almost minimalist shoes. Even if you are doing a short, high intensity workout, then you will have plenty of support. They are light and very flexible indeed. These are best suited for walks between 5 and 10 miles, by my guestimation. Saucony’s are not for everybody. Either you love it, or you hate it. Personally, I kind of like their style. It takes a certain amount of guts in order to bring shoes like these to the market. Anybody who has ever seen (and liked) Back to the Future 2, will certainly appreciate this design. This is a really nice flexible and comfortable shoe for neutral walkers. I once did a marathon in these and they never let me down. They have great cushioning for long mileage. The greatest thing about New Balance shoes is that they come in a wide variety of widths. People with wide feet can have a real field day in a New Balance store. This model I am reviewing here, is the 1080v3 model. It is flatter and lighter than previous versions. The 1080v4 is on the PL-8 last. With New Balance, you will always have to try on an upgrade to a pair of shoes to make sure they fit well. Asics has been producing the Gel-Cumulus for many years. In fact, it’s one of the most popular models of shoes that they have on the market today. With the 20th iteration, Asics decided to go for a complete overhaul. And since it was released, it has enjoyed quite a huge following, especially among outdoor enthusiasts. The outsole is primarily made of two main components – Durasponge material and Asics High Abrasion Rubber or AHAR. Asics High Abrasion Rubber is mainly concentrated around the heel section while Durasponge rubber forms the rest of the unit. AHAR is included in the sole unit to protect the shoe against abrasion while providing traction. On the other hand, the Durasponge rubber material provides flexibility as well as cushioned ride. A couple of flex grooves have been strategically placed in different areas to enhance flexibility. Asics has replaced the plastic support trust found in the midsole of the earlier versions FlyteFoam technology. This technology gives you a high-energy return, better performance as well as responsiveness. FluidRide technology is the main midsole material. Apart from being sturdy and lightweight, this material also comes with great shock-absorption capabilities as well as a high-rebound capacity. Both the forefoot and the heel areas are fitted with gel inserts, which provide shock absorption while promoting smoother transitions during the gait cycle. An Ortholite sockliner has also been included in the midsole for additional cushioning and underfoot protection. Also, the sockliner comes with antimicrobial properties, thus helping to maintain a healthy environment inside the shoe. These lightweight walking shoes for travel come with an upper made of a flexible jacquard mesh material. This material breathes better than previous versions. Apart from that, it helps to maintain a light feel. Also, the jacquard mesh material is elastic, thus providing a customized and flexible fit. Asics has used its advanced Discrete Eyelet System, featuring independent holes for a customized fit. If you are looking for a pair of lightweight walking shoes that deliver a flexible fit, ultralight cushioning, a comfortable wearing experience and all-day support, then the Gel Cumulus 20 is a reliable choice. This shoe has fantastic durability and cushioning. Despite this, it is still very lightweight. Some people love Saucony, others hate them. For some, they are a great fit, for others, not so much. They have a very specific fit. These Triumph 9s have dropped the heel by 8mm. Lower heels are often appreciated by long distance walkers. The Triump 10 has dropped the heel even more. However, the 10s are a more expensive model. It is best to get these when they are on sale. Brooks caters to those who know what kind of shoe makes for a good, lightweight walk. Brooks offer rounded heels and flatter shoes. They are very cushiony and will make sure that you stride with pride all throughout your day. It does not matter whether you are going for just a walk around the block, or whether you are going for a day out. Heck, you can even take these puppies for a hike on an easy trail, if you wanted to. All around good shoes that won’t let you down. Thanks, don’t forget to tell your friends! Outstanding. Thank you so much for putting this together. I’ve been looking for a pair of casual shoes for my mom and this list is incredibly helpful. Dated expression I know, but you are the (da?) bomb! Thanks, you just made my day. Please tell all your friends about the Boot Bomb!